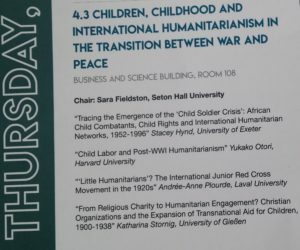 While the historical role of children and notions of childhood in times of war and crises generally constituted an important theme at the Ninth Biennial Conference of the Society for the History of Childhood and Youth (SHCY), one panel was explicitly dedicated to the study of international humanitarianism and attempts to protect children in the transition between war and peace. 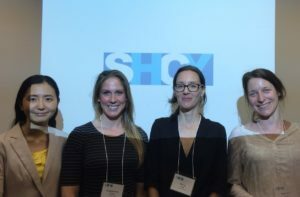 The panel was organized by Yukako Otori (Harvard University) and Andrée-Ann Plourde (Laval University) and included presenters that had first met in the framework of the Global Humanitarianism Research Academy (GHRA). The panel, which was chaired by the distinguished historian of international child welfare and author of Raising the World: Child Welfare in the American Century (Harvard University Press, 2015) Sara Fieldston, explored the intersection of international attempts to protect children and the history of humanitarianism on the basis of four case studies. Opening the panel was historian of Africa Stacey Hynd (Exeter University) who discussed the construction of the “c hild soldier” in the second half of the twentieth century. Presenting rich examples from the involvement of children in armed conflict from the 1950s (the Mau Mau rebellion) to discussions in the United Nations in the mid-1990s, she, firstly, showed how child soldiering was gradually constructed as an African phenomenon. Secondly, tracing how legal, human rights and humanitarian discourses and norms discursively produced the image of the “child soldier”, Hynd argued that it was precisely the divergence of this image from the actual experiences of children actively involved in war that ultimately limited the effectiveness of humanitarian intervention. The intersection of humanitarian campaigning and international legislative efforts also constituted a major theme in the second presentation by Yukako Otori. Exploring the making of international child labor law in the interwar years, Otori not only traced the emergence of a set of conventions against child labor issued by the International Labor Conference, the highest legislative organ of the International Labor Organization (ILO), but also pointed to the limited effectiveness of these conventions when it came to the ratification and enforcement by the individual member states. Yet, as she pointed out, the legislative efforts of the 1920s nonetheless produced significant shifts in the understanding of child labor, which was marked by a growing sensitivity towards non-industrial labor as well as long-terms negative effects such as for instance interrupted schooling. 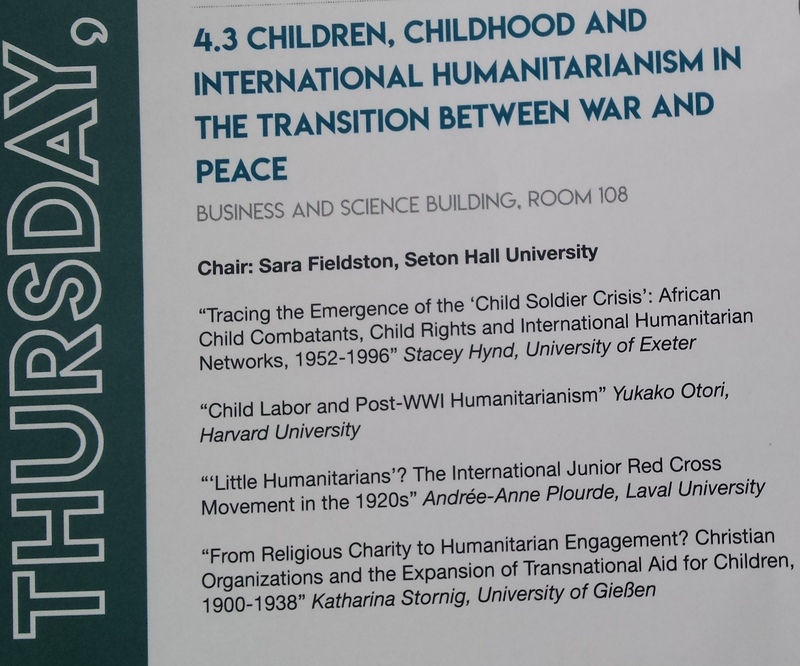 The third paper by Andrée-Ann Plourde likewise took the early 1920s as a starting point to study heightened efforts to include children to humanitarian practices and campaigns. However, by exploring the history of the International Junior Red Cross, Plourde discussed children less as beneficiaries than as potential agents of humanitarian assistance and postwar peace-keeping. Analyzing the program of the International Junior Red Cross as well as its major media for a juvenile readership, she showed that teaching children humanitarianism and active solidarity with others in need became one o f the major aims of the International Junior Red Cross in the interwar years. Interestingly, comparable efforts to educate children to offer active charity towards others in need could already be observed in the activities of nineteenth century Christian charities. This aspect was presented by Katharina Stornig (University of Giessen), who, studying the transnational activities of Christian charities, demonstrated that religious organizations had already promoted saving far-off children since the mid-nineteenth century. Founded in the context of the expanding missionary movement, these charities developed and promoted a vision of child-saving that related both to a strong notion of childhood innocence and Christian aspirations for salvation. However, as Stornig pointed out, they developed range of ideas, narratives and practices of child saving that increasingly included secular-oriented aspects of child welfare and thus ultimately proved effective in the organization and imagination of transnational aid for children in the longer term. Studying the child-centered activities of Christian charities, she concluded, not only provides insight into the religious foundations of transnational child-saving efforts but also points to the complex entanglement between various actors, ideas and practices that gave shape to this expanding field in the interwar years. The persistence of religious actors and imaginations of saving children also featured prominently in the in the lively discussion that followed the presentations. 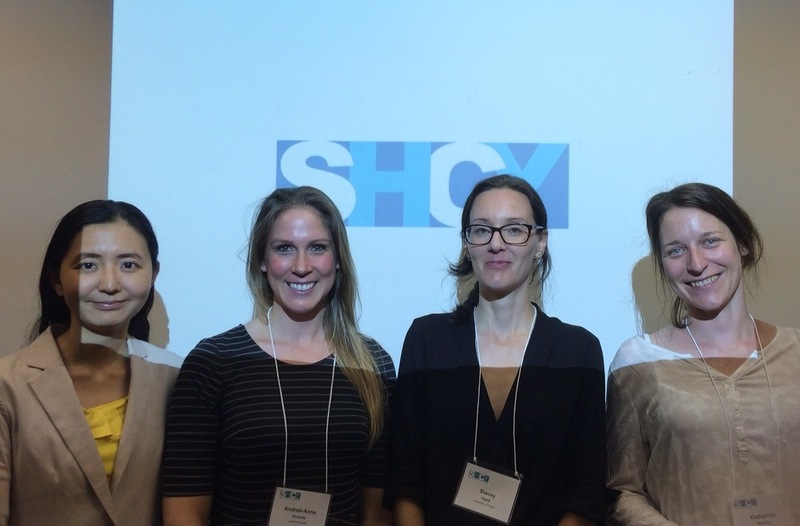 The comments extended beyond the key issues presented, such as the intersection of social constructions of age, gender and race in twentieth century humanitarian child protection or the highly politicized nature of this dynamic field. Considered together, the panel discussed a range of issues, such as for instance the key importance of mass media to the mobilizing campaigns that shaped the venture considerably and created powerful notions of juvenile need, vulnerability and desire. Needless to say, this involves particular challenges for research that aims at understanding both the prevalent notions of childhood and the historical experiences of young human beings whose lives were touched by the activities of a broad range of – mostly yet not exclusively adult – humanitarian actors. This entry was posted in Posts by Katharina Stornig. Bookmark the permalink.